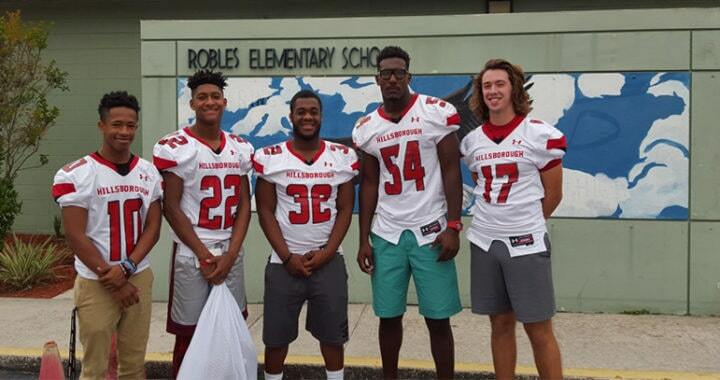 The Single Gender Boys community at Robles Elementary have partnered up with the Hillsborough High School Varsity Football Team to build a strong community of achievers and believers with monthly “Terrier Time”. 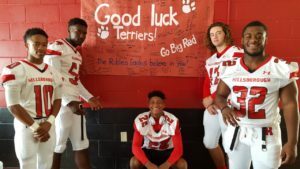 Monthly Terrier Time provides students with an opportunity to connect with high school athletes who understand the importance of discipline, academics, cooperation, and school pride. Students work toward earning time each month with individual players and the coaching staff. Each month focuses on a character trait integrated into their visit through a teamwork activity. The goal to cultivate respectful relationships among students requires a team approach, built on trust and cooperation. So when Victoria Morse, Instructional Mentor at Robles Elementary, reached out to Coach Earl Garcia about starting an outreach program for the single gender boys’ community, the idea for Terrier Time was born. From there, The Hillsborough Varsity Football Team, their coach Earl Garcia, Vanessa Oatman, Executive Director of the Hillsborough High School Football Association, Athletic Director and Assistant Principal for Administration Mickey Boddie, and Principal Gary Brady at Hillsborough all jumped on board to make this idea a reality. Robles Principal Bonnie McDaniel has been a big supporter since the beginning. 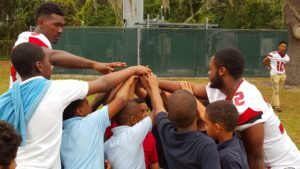 The football players are learning valuable lessons such as the importance of giving back and community service. One of the players, Wilson Morse, raised money for small footballs to bring to all the students last month. 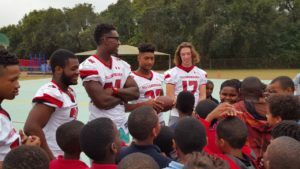 During Monthly Terrier Time, the players talk with the students and mentor them. PowerPoint presentations are created using pictures from their visit, along with a character trait focus that the teachers share with their students. Future events are planned such as a Saturday Sports Day at Robles Elementary, and a field trip to Hillsborough High School. A final event will be the Terrier Spring Jamboree Football Game where the students will be able to meet all the players and coaching staff.